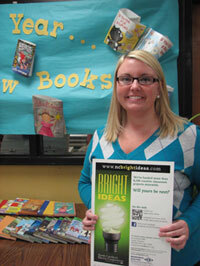 First-year media coordinator Dannelle McPherson of Hallsboro-Artesia Elementary School (Columbus County) applied for a Brunswick EMC Bright Ideas grant for new books for her school’s library. The shelves were sparsely stocked with worn and outdated books. McPherson surprised a group of 3rd and 4th graders with a colorful display on the wall and a table full of new titles, including favorite such as the Junie B. Jones series, the Magic Tree House series, and If You Give a Dog a Donut by Laura Numeroff. 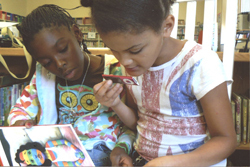 “The new books really sparked our students’ interest in reading,” McPherson said. 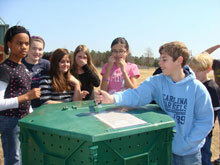 Triangle Day School Students "Bring Science to Life"
incomplete life cycles of the praying mantis and milkweed bugs. 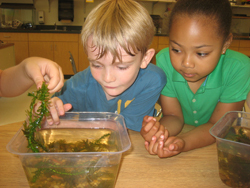 Third and fourth graders studied plants, animal behavior and adaptations, while fifth graders built eco-columns and connected a terrarium to an aquarium, teaching them about the inner-connectivity of land and sea. 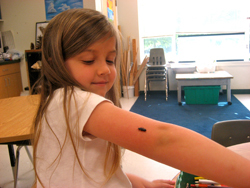 Although each grade level used different materials and required unique lesson plans, Dr. Nelson was able to fully engage her students through discovery-based learning, thanks to her Bright Ideas grant funding. 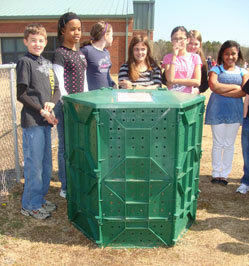 Nathan Stack, a teacher at Alderman Road Elementary in Fayetteville, used his Bright Ideas grant money to purchase a 180-gallon composter. The project, called "Greening up Our School," was sponsored by South River EMC in Dunn, and it aims to teach students to make better food choices and to be mindful about wasting food. 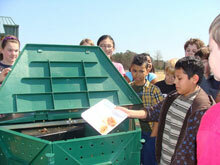 The composter contains food items such as leftover fruits and vegetables, yard waste and coffee grinds. After these materials decompose, students will use them as fertilizer around their school. Congratulations to Mr. Stack and all of the students at Alderman Road that will benefit from this innovative project. Rachel Smith, a teacher at Cerro Gordo Elementary, won a Bright Ideas grant through Brunswick EMC for her project, "Reading, Writing and Blogging." The grant funding purchased five iPod nanos that were used nearly every day to bring some excitement into her classroom and help improve reading fluency and comprehension for her third and fourth grade students. 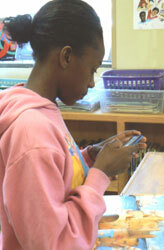 Students selected poems and short stories to record on the iPods. They were then able to listen to themselves reading. They concentrated, took the time to decode more difficult words and read with expression because they knew their classmates would hear the story later. 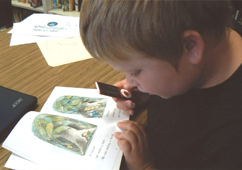 Many students voluntarily read the same story repeatedly, perfecting their recording. Smith notes, "My students loved the iPods, but I think it was also valuable for them to understand that we received them from a local business that was interested in their education. The kids were just fascinated that a company was using their money to help our class. 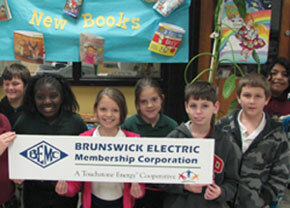 Several of the students wanted to know if we had to 'pay back' Brunswick EMC. I explained that although we didn't return any money to the business, we repaid the investment by doing our best in school."